Into the Void – Ref’s Notes 3. We’ve now played three sessions of my classic Traveller campaign, “Into the Void.” I really should say “our” campaign, because at this point the players are starting to make it their own as well. It’s pretty damned amazing how much fun you can have with those three little black books. In some ways they are the barest outline of a game system. Nowhere in them is there even an example of play! And yet they are amazingly complete and flexible. 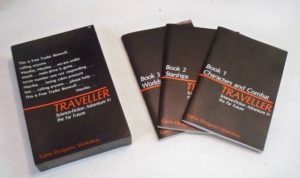 Back in the old days when my friends and I played Traveller one a week, I don’t think we had the experience to appreciate just how well the rules work. Frankly, there weren’t really many complex, “crunchy” systems out there to compare it to. The ship combat system is actually really good. It seems like a ship combat system from a war game, that’s been simplified to fit into a roleplaying game. With small ships at least, combat is something to avoid. In our most recent session (#3), the PCs ship got into a skirmish with a slightly larger ship. We had one round of combat, resulting in the PCs hull taking a hit and depressurizing and the enemy ship having it’s maneuver drive disabled, putting it dead in space. That’s in one round of combat. We didn’t even get to draw the movement vectors on my game mat! The time scales are way different between ship combat and personal combat, so with PCs running around inside the enemy craft during the ship combat, we first did some personal level stuff inside the enemy ship, then the ship combat round, then more inside the enemy ship. The effect was actually really good – very cinematic. I think we all liked it. As Ref, I thought it all fell together well. I’m trying hard not to turn these sessions into dungeon crawls. Now, I think that can be fun sometimes, but it seems too lazy. But I’ll admit — it is tempting. When I’m sitting there, writing, working on ideas, I do sometimes thing “man, it would be easy to have them explore a complex building.” But that’s not the direction I want to go with this. It needs to be about action, ideas, drama, conflict, and story.